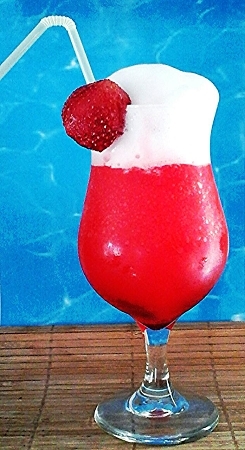 Strawberry Daiquiri is another new drink we have added based on customer requests. 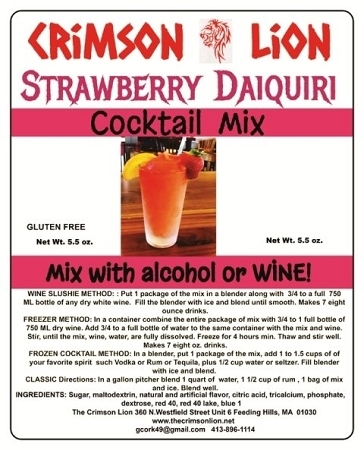 Directions: STANDARD METHOD: In a pitcher combine 1 package of the mix with 2 cups of rum, 2 cups of water. Stir briskly. Add ice and Garnish with lemon. Yields 8 (4) oz drinks. Based on using a 56 oz. blender: 1 package of the mix with 2 1/4 cups or 3/4 of 750 ML bottle of dry white wine, fill the blender with ice, blend, and enjoy this popular drink. Based on a 56 oz. blender; 1 package of the mix, 1-1.5 cups rum, 1/2 cup water, fill the blender with ice, blend and serve. Enjoy! !